Given a sprig of Mullein (the called moly) by Hermes, Odysseus managed to escape the fate of his companions who were turned into swine after eating a feast of cheese and wine laid out for them by the enchanting witch-goddess Circe. The earliest readers of the Odyssey also fashioned the plant’s fibers into lamp wicks. Understandably, they called it the Lamp Plant. A little later, the Romans used torches of Mullein to illuminate their funeral processions. Speaking of the Romans, it’s said that Mullein got its common Latin name, Thapsus, because the plant grew with such alacrity outside of a town with the same name. It just so happen that this was same the town in which Caesar won a decisive battle after which Cato the Younger killed himself. Caesar’s soon to be successor, Augustus maintained the fragrance of Mullein could over power demons. In his 5 volume De Materia Medica (On Medical Material), the great Greek physician Pedanius Dioscorides wrote of the many uses of Mullein which, according to him, is an excellent expectorant when smoked, good for a cough when boiled as tea, and helpful in fighting off streptococcal infections when ingested. By some fate of providence, De Materia Medica did not disappear during the Dark Ages but stayed in circulation throughout, was translated into Italian, German, Spanish, and French, and served as the basis of much medical knowledge well into the 16th Century. Not so much with the science, Pliny the Elder linked mullein to witches, but linking the power of plants and the ladies was nothing new nor rare for the author of Naturalis Historia. As if somehow its ability to alleviate a cough was completely obvious, which apparently it was, everyone from ancient Indian Ayurvedic physicians to Salem bound Puritans used it to treat chest colds. Once brought to “North America” the indigenous peoples therein quickly adopted it for the same use, which was fortunate given all the new diseases their new and unwelcome cohabitants brought with them. 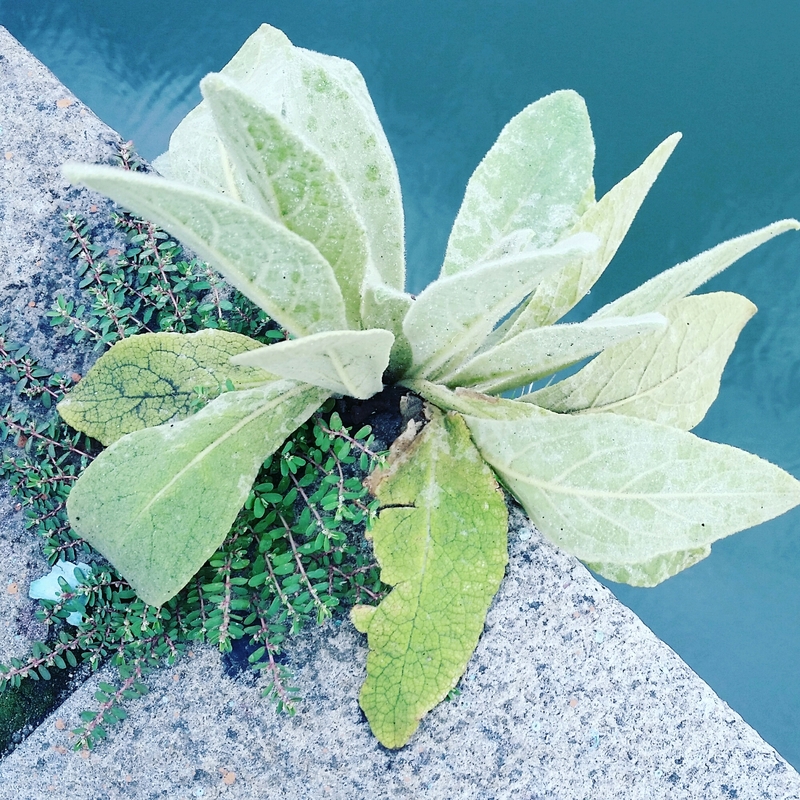 Excellent examples of this remarkable plant can be found growing along the concrete banks of Newtown Creek, in the temporarily vacant lots of Gowanus, and north of 125th Street in Manhattan.